We are so proud of our drivers! As they accomplish safe mile goals or qualify for other awards, you can read about it here. Chris Patton has been with CalArk since September of 2006 and lives in Humphrey, Arkansas. His CB handle is "Runt" because he was always the smallest in his family growing up. He has one brother and two best friends who are like brothers to him. Before coming to CalArk, he worked on a farm most of his life and was running trackhoes (excavators) and bulldozers at the age of 12. Chris says, "If it has wheels or tracks, I can drive it." If he can't operate something, it doesn't take him long to figure it out. When not driving, he likes to hunt, fish, and shoot guns, but he says all he really knows is work. His dad and grandpa started him out at a young age. When he was 11 years old, his mother picked him up from school, and he got excited when she said his dad had gotten something for Chris and his brother to "play with." Hoping to see a new toy, Chris says he instead found a brand new chainsaw. His dad told him the plan was to use it the following weekend to collect wood to sell and that they needed to make enough money to pay for the chainsaw. Chris intended to join the military, not drive a truck, after he graduated in 1995, but an accident with a 12-gauge shotgun changed his plans. In February of 1995, while hunting with some friends, Chris's shotgun misfired and shot a hole through his right hand, thus changing his career path forever. Through months of plates, screws, and several reconstructive surgeries, Chris kept a positive attitude. 12 years ago, CalArk's then-Director of Safety, Dennis Hilton, took a chance on him. Chris was ready to get to work driving a commercial motor vehicle, but regulations required him to have a special certificate called an SPE because of his injured right hand. He was concerned about how he was going to pay bills while waiting on the SPE to be approved. Dennis told him, "We're going to do what we need to so you can drive for us." Dennis then asked the maintenance shop to hire Chris while waiting for his certificate. Two months later, Chris was driving a CalArk truck, and he's been in one ever since. He has since experienced tremendous success as a professional truck driver with CalArk. Among awards and recognition over the past 12 years, in addition to his current 1.5 Million Safe Driving Miles, Chris has achieved 100,000 to 1.25 Million Safe Driving Miles, 100% On-Time Delivery each year, Company Driver of the Year 2nd Runner Up 2008, Company Driver of the Year 2009, Company Best Fuel Mileage 2009, 2010 Arkansas Trucking Association Driver of the Year, 5 Year Service Award 2012, 10 Year Service Award 2016, Company Driver of the Year 2nd Runner Up 2016, was featured in Truckers Newspaper Magazine in 2009 and in Changing Lanes Magazine in 2011. 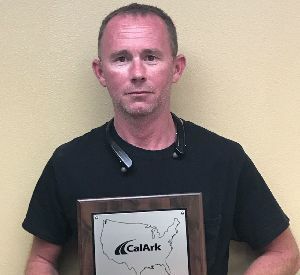 Chris has also represented CalArk in the Annual Truck Convoy for Special Olympics and at the Arkansas Truck Driving Championship multiple times over the years. Michelle Finn, Chris's Driver Manager, says, "Chris is a team player. He is extremely hard-working, professional, and dedicated. He is a high achiever and an amazing person to work with every day. I could not imagine being able to my job without him. He's a comedian when everyone is in need of a laugh. I could be having a horrible day, and he always takes a minute to cheer me up. He's just a great guy all the way around." Chris had positive words to share about his Driver Manager as well, saying that Michelle takes care of him and keeps him running the miles he needs. In today's industry, it is a great accomplishment to stay with one company for 12 years. Chris says he has stuck with CalArk because of what Dennis Hilton did for him. Chris also says he told himself at first that he would give CalArk one year. Then he gave us two. Then three. Now he has been here so long he doesn't want to go anywhere else. Chris says, "When the President of the company sits down with you during Driver Appreciation Week and knows your name, that's special. Some people may not think that's anything, but that's huge to me. I'm happy here." When asked what he would say to new drivers coming to CalArk, Chris says, "Find your way. Find your niche. Give it at least one year. If you have a problem, talk to someone. If you are willing to work, CalArk will work with you. You get out of it what you put into it. You will have bad weeks, and it may look like there is no end in sight, but stick with it." Thank you, Chris, for sticking with it at CalArk. We are very fortunate you chose us and that you keep choosing us. Congratulations on 1.5 Million Safe Driving Miles. It's truly drivers like you who keep the Wheels of American Business rolling.